As if my kids didn't get into enough trouble on there own, Jingles came to our house a few days ago. Jingles is our Elf on the Shelf. He comes every Christmas. It's such a cute family tradition. I'm sure y'all have seen people posting pictures of their Elf on the Shelf on Facebook. He's Santa's little helper that comes to our house every Christmas to keep an eye on the children. He goes back to see Santa every night to report on their behavior. The next morning his location has changed. Jingles gets into more trouble than the kids could. Well the other night Jingles thought he'd get into my baking supplies. Oh Yeah......Death to the Elf! But then when I saw the cute cookie he made, I wasn't so upset with him anymore. Now he's a little bit full of himself because he made a cookie of HIMSELF. But hey, it's all good.......because he picked up all his mess too. YEAH for Jingles! How do you like his little piping bag? Pretty cute huh? Ok so I just thought I would share Jingles and his cookie. This is exactly how my little cookie monster found him. How could I get mad at him? He can cookie! And can I say how in love I am with all your sprinkle jars? If only Mike would let me have that many sprinkles. I'm secretly building my sprinkle stash, shhh. This is such a cute post!!! And I want all your sprinkles jars!!! Oh my gosh! I am on live with yours! I'm do glad you linked him in the comments! Somehow I missed this post and Lorraine just told me so I came searching. ADORABLE! 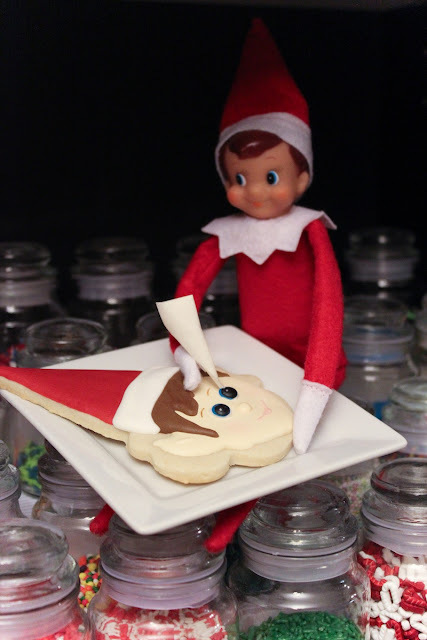 I just learned of the Elf On A Shelf a couple weeks ago and bought one as a gift for my mom. Great job as always Giselle! Your cookies are always adorable! Awww thanks. So are your's! I love looking at all your cookie designs.